All chiminea's and fire pits need some kind on instructions. Clay chiminea's and cast iron chiminea's are fireplaces and we are going to burn fires in them. Each type has it's pro's and con's and both types are great but they both need a few instructions. And shameful enough most retailers sell chimineas without instructions. We all assume it's basic enough we don't need them but we do need them. They aren't complicated but a few helpful tips go a long way. Are pretty basic. Just make sure you have a good safe spot. You'll want to take into consideration wind, and flying ashes. If they ashes fly where are they going and what can they do? We highly suggest using a safety screen for your fire pit. Highly highly suggested. If you have a fire pit and the screen needs replacing we sell replacement screens. We also make custom sizes screens as well. All I can say about fire pits is - They are open pits. If the wind changes- be ready before it happens. once of protection is worth a pound of cure. Think ahead of any potential problems that might arise. Then your set. Enjoy! are pretty much set to go. But there is usually some assembly required. Once the chiminea is assemble put it in a predetermined location. This chiminea isn't some thing your going to want to move around a lot. They are heavy and hard to handle and a cast iron chiminea WILL break if dropped. Cast iron chimineas will get hot VERY fast. Clay chimineas will get hot as well but not like a cast iron chiminea. THe best investment with any chiminea especially a cast iron chiminea is a good set of thick, long sleeved stove gloves. I stress - Be careful. The cast iron will get very hot and a simple touch will blister. The cast iron chiminea is basically a wood burning stove that's been used in our home for many years. WE just moved it outside. Get comfortable with your chiminea before you start stacking up the fire. Other then what we just mentioned your set to go. Use the chiminea and enjoy. Taking care of your cast iron chiminea? I recommend a chiminea cover . When your not using your chiminea and it's cooled down cover it up. This will save the paint from rusting. Every once in a while your going to need to re-paint your cast iron chiminea and i recommend this re-finishing kit I have put together. It's complete with a wire brush to brush off the rust and it comes with specially formulated heat resistant primer and paint. These two products were made to work together to give you the best heat resistant paint that you can apply out of a can. First thing to do is find a safe place to put your clay chiminea and think about it before placing the chiminea.. Clay chimineas are usually heavy and I know for a fact they are bulky to move. The less movement the less chance you have of accidentally dropping it and breaking the chiminea. So give your back some mercy, fInd a safe spot first, then put the chiminea in place. This is also just as important with cast iron chimineas as well. This spot should be clear of any over hanging trees, branches or brushes. The exhaust coming out of the top of the chiminea has velocity and the heat will rise far beyond the top of the chiminea. So make sure there's nothing above the chiminea to catch fire. The location should be on a flat and have fireproof surface such as rock, concrete, bricks or pavers. Sometimes when your moving the logs and stoking the fire some hot ashes may fall out the front so it's important that it's on a fire proof surface. Some chimineas have fire screens on the front but when your adding wood or stoking the fire the door is open so be careful. So it's just best to play it safe and make sure the chiminea is on a safe surface. And make sure there isn't any brush or combustible material around the chiminea. Once you have found a good, safe spot you will want to put some pea gravel, lava rock or sand in the bottom of the chiminea. You'll want to fill the bowl so it's about one to two inches below the opening. What this does is it keeps the coal off the clay and it also raises the top of the burning fire above the opening. This will keep the smoke blowing out the top. Other wise it will come out the front opening and smoke out the deck. Other then that your set to go. Start out with small fires and get use to your chiminea. Don't fill the bowl and go crazy. get to to know it. It doesn't take much to get a good cozy fire going. Like I tell my kids- Get a tuned to your fire. We do suggest putting a cover over your chiminea once it has cooled off. This is will add life to any chiminea. Protect it from the sun and all the other elements. is no big deal. What we suggest is once or twice a year apply some chiminea sealer to the clay. That's it. Just clean out the ashes and seal it once in a while. Sealing the chiminea helps preserve the finish and protects the clay from moisture. The worse enemy of a clay chiminea other then dropping it, is water. The clay chiminea will absorb the water and make it softer. The clay chiminea will last with out it the sealer but it will add life and it will protect the finish. 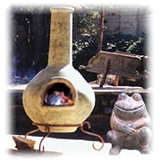 The clay chiminea should be sealed and protected from water if possible. The best method is to be sure the clay chiminea is sealed. See sealer products here. This protects and seals the clay so when it rains the water runs off just like a freshly waxed car. But this sealer will wear off and must be re-applied every once in awhile. This is the most important part of keeping your clay chiminea in good condition. Keeping it sealed. The life of the sealer depends on a lot of factors. Usage is one, not being covered is another. The chiminea sealer will usually last about 3 to 6 months with average weekend usage before needing to be re-applied. Covering your chiminea I think is important. See chiminea covers here. This will prolong the life of the chiminea and protect the paint from the UV rays from the sun. The paint will last longer . I usually keep my clay chiminea covered during the week but on Friday we usually take the cover off. During the weekend we just use a chiminea lid for rain protection. See chiminea lids here. Recover the chiminea during the week. This seems to be the routine our family has adapted and the chiminea looks like new. First off you should have some sand or lava rock or pea gravel in the bottom of the chiminea. Once your ready to clean out the ashes use a small shovel and remove the rock and ashes. and put in a bucket and rinse them off with water. I'll let the rock dry and put the rock back into the bowel of the clay chiminea. If you fill the chiminea bowl with sand just rack out the excessive ashes and turn the sand over. THen your good to go.